Gracious Living Charleston Style…Take that Brooklyn! Many moons ago, Michael, a stalwart member of a grand NYC book group I visit when I can announced he and his sisters, Barbara and Cathy, had bought a home in Pawleys Island, South Carolina. The girls call it home; Michael visits from New York three to four times a year. “Why don’t you come on down in the spring,” he offered. And, Reader, we did one fine April weekend. We came from points south – Jack, Phoebe and me driving from FL – and winging in from the north on the very spartan Spirit Airlines. While the Hampton Inn was our home, Jack and Phoebe were sequestered in a very grim, pet-friendly Motel 6. Jack was skeptical. It’s kind of out of the way (on our dreary route home to the Vineyard), he groused. It’s just a little detour, I countered. We arrived, bucking spring breakers, 13 hours later. The bucolic pond at the Hampton Inn where Michael, our chivalrous leader, defends his flock against an ominous gate-crasher, cruising in upper right. It had poured rain days before the group’s arrival, but the skies cleared and remained postcard perfect for the remainder of our visit. Saturday we froliced on the beach. Charleston, which borders the area known as South Carolina’s Lowcountry, is about an hour’s drive south of Pawleys Island and once there you’ll see pineapple motifs galore. They represent hospitality. But they must have sent a few north cause Michael and his sisters treated us like royalty. Check out the culinary display for our book discussion dinner. To Kill a Mockingbird was on our literary menu and invoked another meaningful chat. What can you say about a novel that perfectly balances a coming-of-age story with that of a memoir; that deposits you smack in the middle of the racially-charged deep South of the 1930s and tackles gender issues. Plenty. A Catered Affair for the Book Discussion Chowdown; David reviews his edition of “To Kill A Mockingbird,” published in May 2010 to commemorate the book’s 50th anniversary. The back of the dust jacket of the original has a picture of Harper Lee taken by her good pal Truman Capote. In 1960, it cost $3.95. To fortify us for our Charleston House and Garden tour Sunday, we had yet another excellent meal chez Michael, Barbara & Cathy. We also surprised Michael with a birthday cake and natal day offerings. If anybody ever deserved being feted!! Michael, The Birthday Boy, eyes his cake as Lauren and David II look on. Crusader Rabbit or Man of Steel. We love them both. Post bunch, the gang caravaned into Charleston. Our starting point was the headquarters of Historic Charleston Foundation. We hoofed it around our East Battery hood all afternoon. At our destinations (we visited 7 houses! ), we were often greeted by natty-looking gents in khakis, blue blazers and boaters. A “uniform,” we were told, that can get you into any Charleston cocktail gathering. The city was jammed. 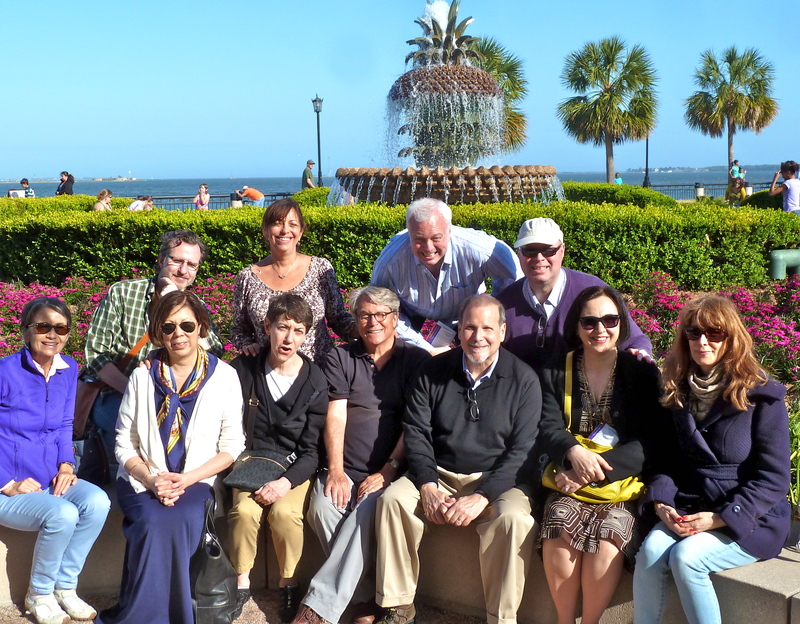 At day’s end in front of the Pineapple Fountain in Charleston’s Waterfront Park—Take the picture already!! Our final dinner was at one of Charleston’s fine dinning eateries, 82 Queen, where Michael had, of course, secured a room of our own. But wait there’s still more…We sped back to Pawleys Island for whatelse? To view the first episode of season six of Mad Men. You all come back and see us real soon! This entry was posted in At Home, Journeys, Reads that Feed. Bookmark the permalink.